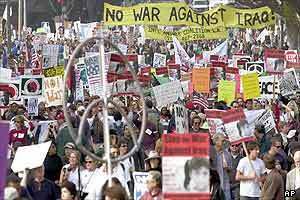 Sunday, 12 January, 2003, 08:12 GMT Thousands join LA anti-war rally Thousands of people have taken part in a rally in the American city of Los Angeles to protest against a possible war with Iraq.
" We are telling the world that we are patriotic Americans but we do not support war with Iraq "
Film star Martin Sheen - who plays a fictional US president in the television series The West Wing - called for Americans to seek a peaceful approach to the crisis over Iraq. Estimates of the number of protesters ranged from 5,000 to 20,000 - police said the event was noisy but passed off peacefully. Among those attending was the anti-war protester Ron Kovic, who described it as the largest such demonstration in Los Angeles since the Vietnam conflict. A similar march is scheduled to take place in San Francisco next weekend. 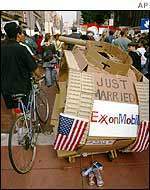 Protesters chanted "no blood for oil" and "stop Bush now" as they rallied around government buildings. "A lot of people have been silenced for a long time, but that is ending," Sheen told the crowd. "We are telling the world that we are patriotic Americans but we do not support war with Iraq." Sheen pushed the wheelchair of Vietnam veteran Kovic, whose story was featured in the film Born on the Fourth of July. Mr Kovic said the government was leading the country into "a situation that can only hurt us a nation". "We love this country. That's why we're here. This is about democracy and we're against this war," he told the demonstrators. The rally also included performances by musicians Jackson Browne and Guns N' Roses' guitarist Slash - the latest celebrities to join the anti-war campaign in the US. Last month, Matt Damon, Angelika Houston and Kim Basinger were among a group of Hollywood stars who called on the Bush administration not to go to war.